“Fury of Solace” is a truly immersive transmedia experience, and this post serves as a site map, designed to help viewers best experience the entire story. The best place to begin the “Fury of Solace” experience is the Characters Page, which features bios for all of the major characters, as well as links to their Twitter pages, blogs and any other relevant supplementary material. 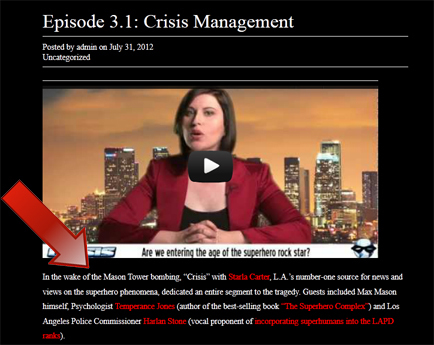 Then jump over to the Episodes Page to start watching the videos. Each episode is accompanied by a third-person narrative contextualizing that particular installment, linking to recaps of any transmedia experiences that are relevant to that episode. Many of our episodes are character vlogs set in the world of the show, which afford fans the opportunity to engage with the characters the same way that YouTube vloggers engage with their audience. For viewers who are late to the party, we use Storify to recap important Twitter interactions, which shed further light on the episode at hand, and chronicle the Alternate Reality Games (ARG’S) we’ve staged to advance the story. Here are a few examples of the ARG’s in which “Fury of Solace” fans have had the opportunity to participate. The Orphan’s Twitter followers helped her uncover a password protected video posted by Fury of Solace. Fans at San Diego Comic-Con helped Fury of Solace crash a dinner date between evil CEO Max Mason and a woman interviewing to be his superhero bodyguard in our first real-world ARG. Followers of the conspiracy blogger Uroboros helped him and Fury of Solace hack into a Twitter account belonging to a shell company under Mason International’s umbrella. Uroboros created a new conspiracy blogsite called the Lighthouse, which he bequeathed to a real-world fan in the UK, who has since been posting in-canon blog posts and co-administrating the site with another one of our characters. 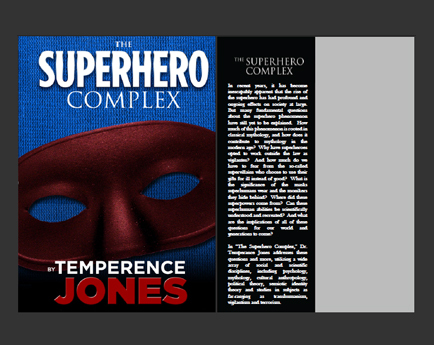 The “Fury of Solace” team delves even deeper into the fictional world of the show with supplementary materials like this magazine article about Kat Czerny, or this book preview of a non-fiction book called “The Superhero Complex” written by the character Temperance Jones. 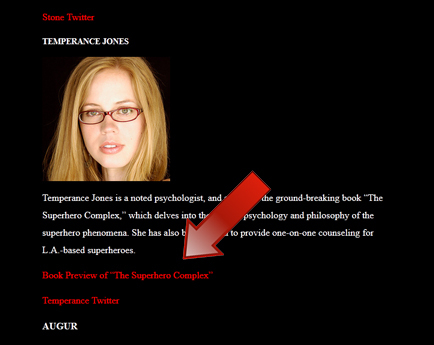 Screenshot of "The Superhero Complex"
Peek behind the curtain via “Fury of Solace” creator Emmett Furey’s transmedia blog Coefficient of Fiction. Every year, Mason International’s annual charity ball raises obscene amounts of money for whatever charity is in vogue at that particular moment. Max Mason announced that the proceeds of this year’s charity gala would benefit the families of the people who lost their lives in the Mason Tower bombing on an episode of “Crisis” earlier this year. The ally in the police department that Laurel speaks of is Detective Katherine Czerny. The two became fast friends after they worked together to uncover the Medina Cartel corruption scandal. And as it turns out, Laurel’s concerns about Emmett watching this vlog are likely unfounded: Back in 2010, Laurel wrote a blog entry explaining why her boyfriend tends to steer clear of her social media sites. A few weeks ago, Laurel revealed on her vlog that somewhere out there is a long-lost witness to her parents’ grisly murders. Laurel proceeded to tap her contacts in the LAPD to try to track down the errant witness. Episode 5.2: How Do You Kill a Snake? Prior to his death, Uroboros posted an interactive map detailing everything he had on holdings belonging to Mason International and the King criminal empire. 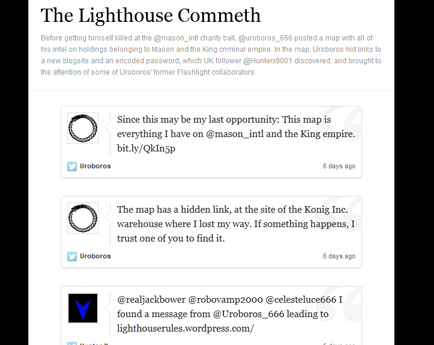 One of his UK followers found a hidden link within the map to a new conspiracy blog Uroboros had set up called the Lighthouse, the heir apparent to the now-defunct Flashlight. The proprietors of the Lighthouse opted to make the site a collaborative effort, and have invited guest blog entries from any of their followers. The red-clad prophet that Uroboros refers to is none other than the mysterious Augur, whose machinations can be felt throughout our entire story. But is Augur merely foretelling the future, or is he also influencing it? Before setting out on his fateful trip to crash the 2012 Mason International Charity Ball, Uroboros posted an interactive map with all the information he’d been able to acquire on holdings belonging to Mason International and the King criminal empire. Just before heading to the ball, Uroboros Tweeted that there was a link hidden on the map at the site of the Konig Inc. warehouse where he “lost his way,” which he hoped one of his followers would find if anything happened to him. Click on the image below to access the map. As it happened, a UK-based Flashlight devotee was the first to discover Uroboros’ clue, and found the hidden link by clicking on map point 9, uncovering a personal letter from Uroboros. It led to a new, empty wordpress site called “The Lighthouse,” created by Uroboros. Uroboros believed his own blogsite, The Flashlight, had been tainted by his violent actions, but wanted to bequeath a new site to those who could continue his work of shining a light on the truth. The Twitter user who discovered the site, @HunterX9001, found a login password hidden in the map, and started posting entries on the new site. He also informed Uroboros’ former Flashlight collaborators. But Uroboros’ map holds more secrets than just the link to the Lighthouse. 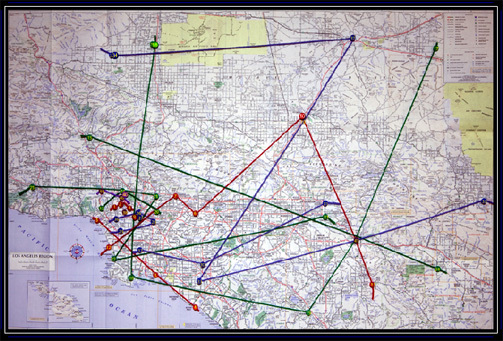 Hovering over the map points with a mouse pointer brings up detailed descriptions of each site, and Uroboros’ musings on their connection to the larger conspiracy. If the major players follow these bread crumbs, Uroboros may yet have the impact in death he so wanted to achieve in life. After Laurel revealed on her vlog that an unidentified woman had witnesses her parents’ murder years earlier, Laurel enlisted the aid of her friend LAPD Detective Katherine Czerny in attempting to track the long-missing witness down. Click here for a recap of the event as it played out on Twitter. After murdering Dr. Marcus Alrand in cold blood, Uroboros went on the run. Shortly thereafter, Uroboros received a desperate cry for help from a loyal reader of his conspiracy blog “The Flashlight.” A woman known to him only as Rabid Mongoose claimed Mason International’s security team was bearing down on her, intent on doing her and her family harm. Uroboros endeavored to save his friend, only to discover that Rabid Mongoose was not who he thought she was. 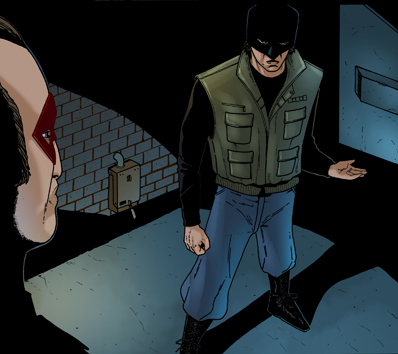 Uroboros narrowly evaded the trap that Mason International had laid for him, but Mason’s head of security Damian Durand promptly uncovered Uroboros’ true identity. This forced the conspiracy blogger to flee his apartment and go on the lam. And after executing Dr. Marcus Alrand for his involvement in Mason International’s alleged illegal human experimentation, Uroboros left all pretense of passive resistance behind. He began producing crude pipe bombs from recipes he found on the internet, and started indiscriminately bombing heavily populated areas: as far as Uroboros was concerned, anyone who was involved with Mason International was fair game. As his campaign of terror was reaching a fever pitch, Starla Carter, host of the popular superhero news program “Crisis,” dedicated an entire show to the Uroboros phenomena. Stay tuned for more videos next week!